TOOTH GERM: Hospital vs. Practice - What's the Difference? Hospital vs. Practice - What's the Difference? So I work in both a hospital environment and in practice. But what are the main differences I've noticed? Patients can be more patient in hospital (mind the pun!). There is an expectation that it is usual to wait around in hospital, especially if it's a walk in service. In practice I felt like patients are more aware of timings. As I've mentioned above, I think running late in hospital in general is more accepted than in practice. Moreover, depending on the environment you work in, there may be other colleagues who can help you out if you run over. Certainly at Guy's, when I run late, patients can be seen by my fellow DCTs if they have a gap or are running early. Alongside this, the time pressures of practice do not really apply in hospital. In practice, generally I have 20 minute slots for extractions compared to at least 45 minutes in hospital. Some of this is down to fact I do more complex surgery in hospital and also the logistics of setting up your surgeries and sourcing equipment. When you work in practice, if you see more patients, you get financially rewarded for this work. You don't have that pressure in hospital. This does not mean you don't work hard in hospital, but it certainly takes the pressure off especially if you're a GDP with a high UDA target! Again this can depend on your individual environment. Practices in general are smaller with fewer colleagues compared to secondary care. This can be a good thing, it can be a bad thing. If you are a dentist practising solo in a surgery and get stuck or need assistance this really limits your work. Having a second set of eyes I feel are invaluable - whether it be a second opinion on a radiograph or reassuring a patient that a tooth really is unrestorable. Being in a hospital environment you also get to learn from so many different clinicians with different styles of working. This can help you develop your own style of dentistry and it also means there is always support for you if things go wrong. However, working within a big team does have some disadvantages. Sometimes you may be placed to work with a nurse you may not get along with or who doesn't know the way you work. You can also become a bit of a number in the system if you're working in a large organisation where your own say in how things are run isn't really taken into account which may be an issue if you're unhappy with your workplace. Working within a small practice you may have more say in things like ordering in the materials you like to work with. Of course a lot of what I've just said are generalisations and entirely dependent on working environment you are in! Especially for younger dentists, the more targeted support you get through a hospital training post allows you to provide more complex treatments under supervision. You can also provide treatment for those who aren't suitable to be treated in primary care, whether this be down to a medical problem or a behavioural one. You are also not limited to the treatment that a patient can afford since in secondary care they do not pay for treatments. This means you can do full arch composite build ups or Gold restorations for example, which some patients wouldn't be able to pay for out of their own pockets. This means you can devise an ideal treatment plan without having to take into consideration a patient's financial background. 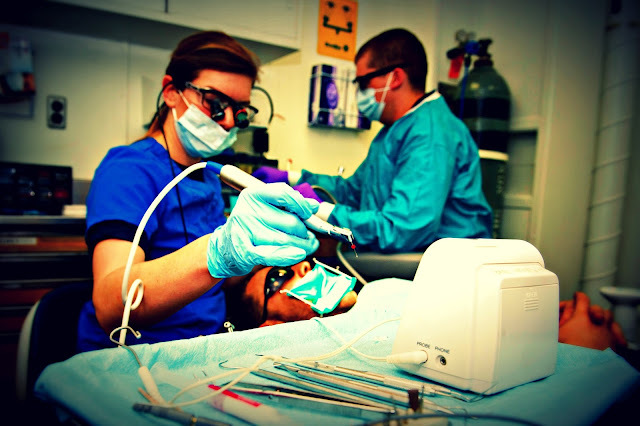 But working in hospital tends to narrow your field of dentistry into a certain area. If you do an Oral Surgery post you may be excellent at extractions at the end, but picking up a handpiece to do a crown prep may feel alien. These are just some of the differences I've noticed between my different jobs in hospital and in practice. Of course some of these are generalisations so please don't take offence if they don't apply to your situation! I am aware there are large practices out there and again some small hospital units. I certainly feel getting experience in both areas can only be an advantage to help you decide your own career path in dentistry!